In California fruits such as citrus, pears, peaches, plums, and apricots are almost all picked by hand. The goal of this project was to develop a prototype end-effector for mechanized tree fruit harvesting applications. With labor costs rising, growers have been turning to mechanized shakers, however, this can cause damage to the trees. The availability of a more advanced mechanized harvester capable of picking multiple types of fruit would be of tremendous value to growers. The end-effectors currently in use operate based on an image processing technique. 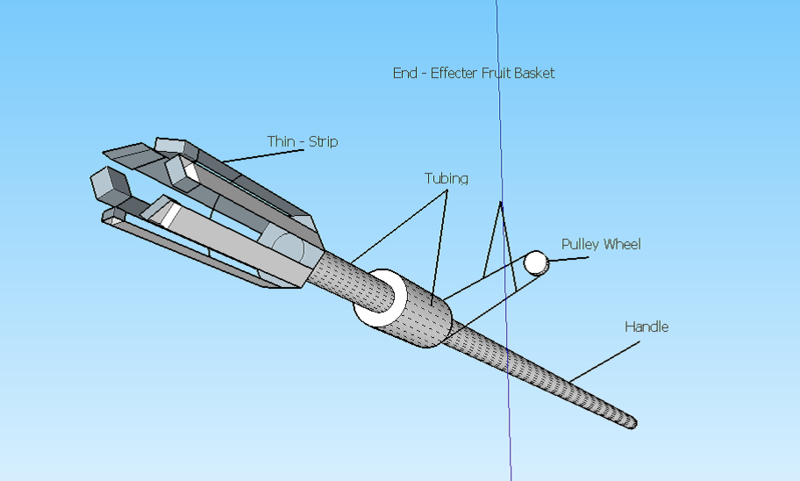 The grant proposed to develop an improved, innovative end-effector that would be modular and could be configured to pick many different types of fruit without damaging the trees. With agricultural operations continually evolving it is becoming crucial for mechanization solutions to become leaner and more productive. This new technology would help growers save on the cost of labor. The end result of the project was to develop a prototype by selecting the appropriate materials and engineering tools, to validate the design through field testing, and to engage motivated students. This real-world experience helps to produce competent professionals for the industry with a greater ability of approaching and solving design problems. This solution-focused approach resulted in the development of an innovative sucking nozzle type end effector. This two-year project was funded by the Agricultural Research Institute (ARI). The unique, new end-effector was developed from scratch and tested and the mechanical, automation, and control designs were achieved.